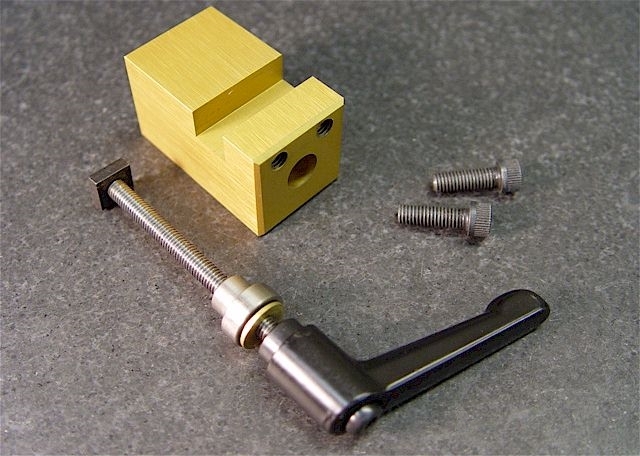 Rocker allows adjustment of the tool bit height. 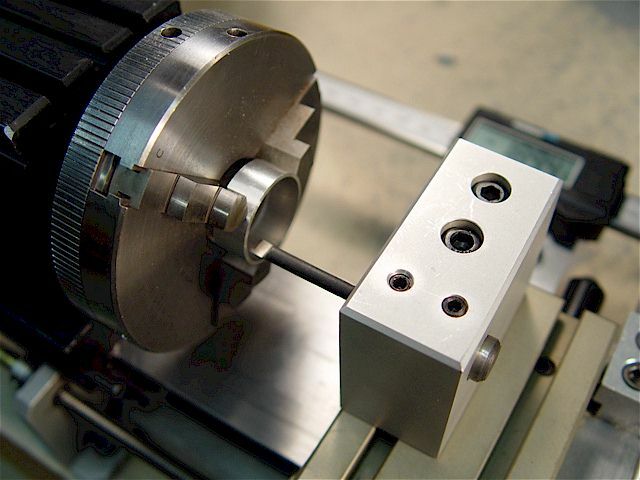 Uses a machined, 1-1/2" diameter, steel rocker. Three rockers were cut from one turning. 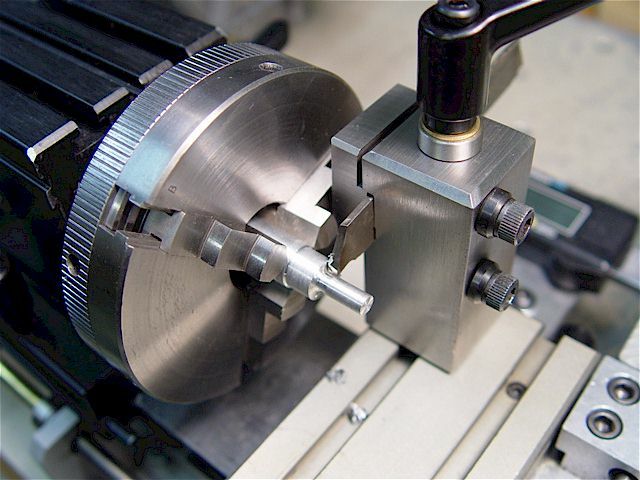 Milled post using a rotary table. Adjust tip height to 1-1/4". 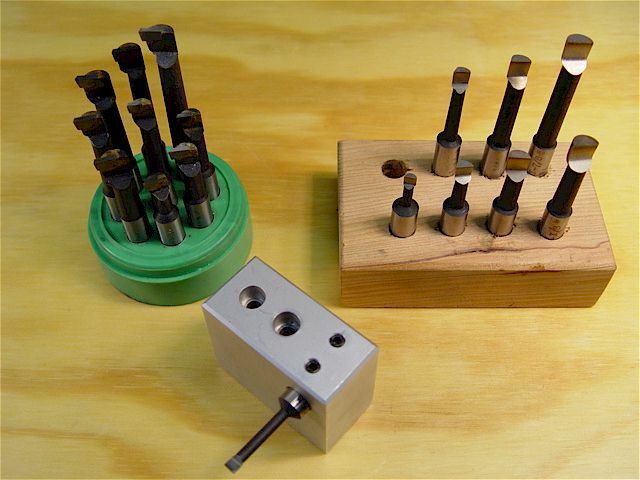 Exploded view of a rocker-style tool post made from a standard tool post. 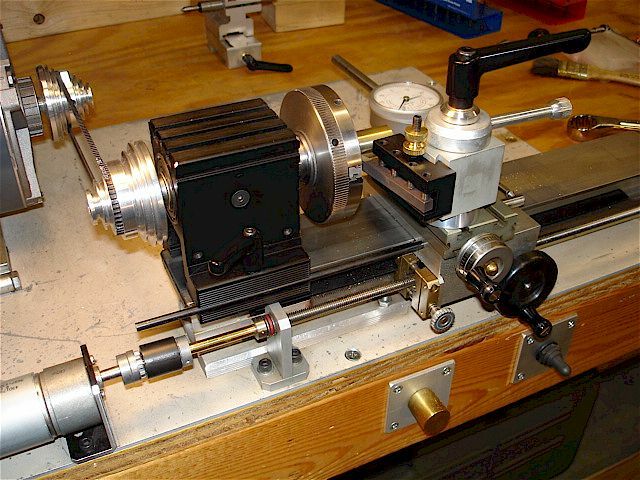 See small manual rotary table. Taig OEM tool post with fabricated steel bushing & ratchet-type Zinc alloy handle. 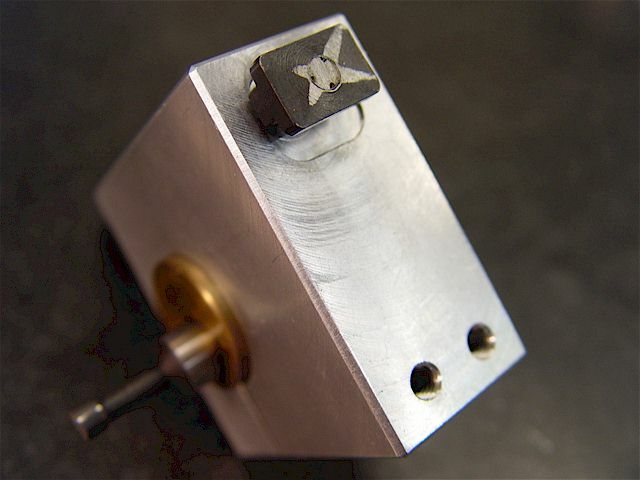 Note recessed area around the bolt for good clamping forces. Steel T-nuts are better. 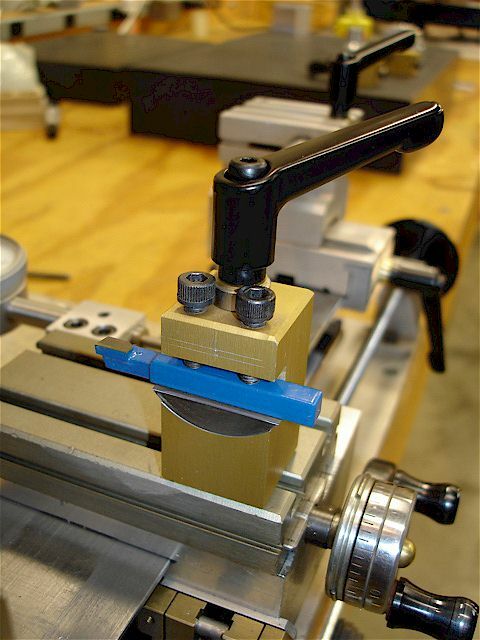 A brass tool bit height gage to quickly set the tip at center (1-1/4"). 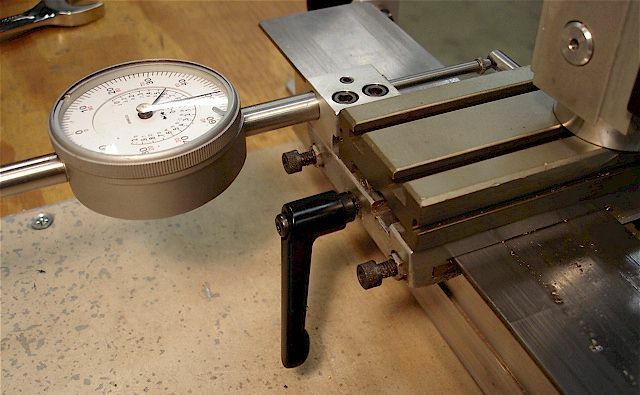 Can be used for setting boring bar & cutoff tool heights, too. 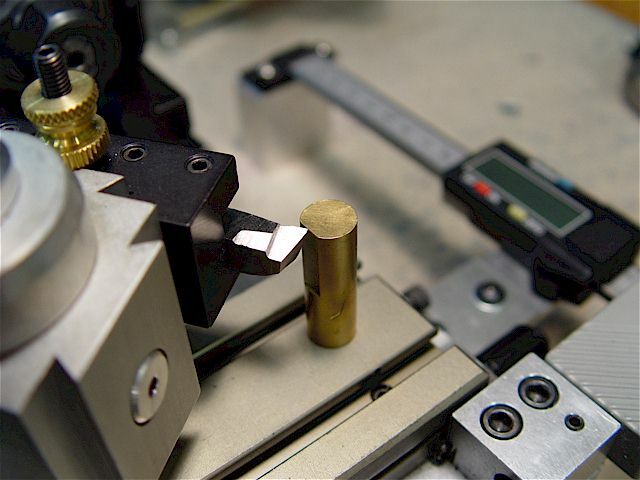 the counter-bored hole. Used a brass washer & a length of 10-32 threaded rod. Top row: rocker & standard posts. 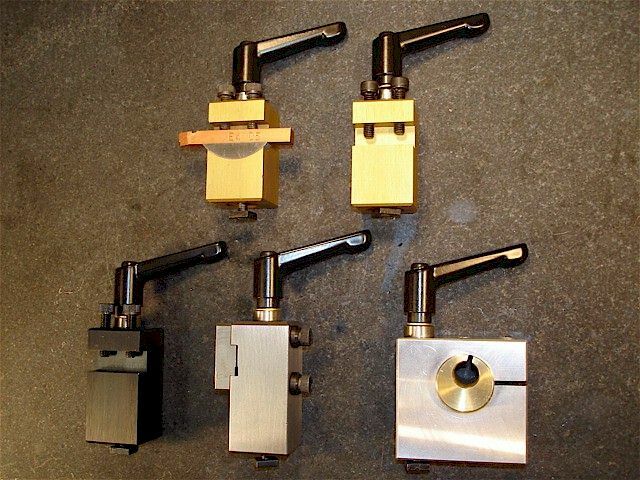 Bottom row: backside tool post, backside cutoff tool & boring bar holder. Cutoff tool blade is used upside down at the backside. 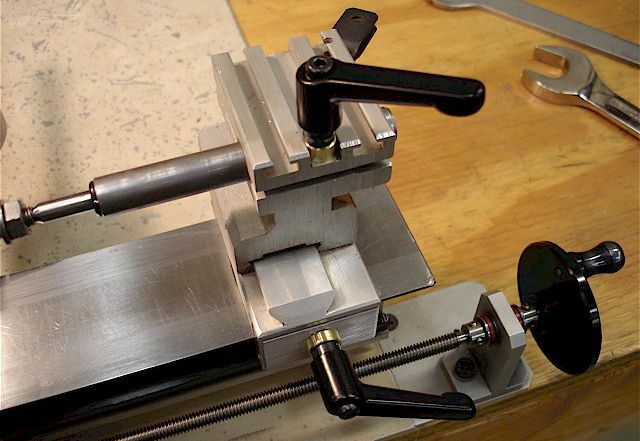 The tool works well & blade is easily re-sharpened. Uses a standard 1/16" x 1/2" x 4" cutoff blade. Superior to the 1/4" x 1/4" shank cutoff tool bit. All-steel construction. 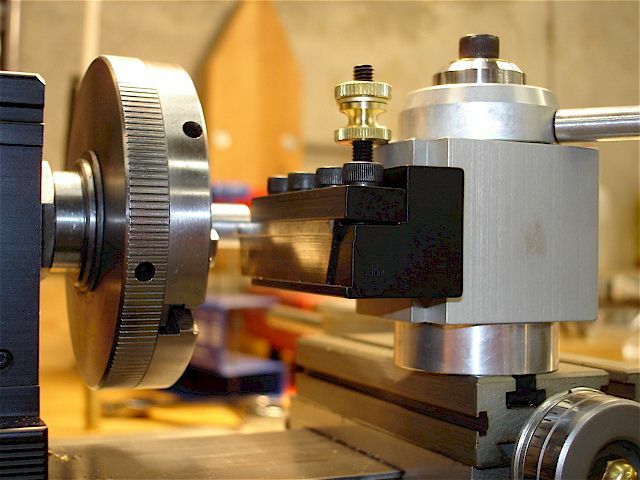 This cutoff tool blade holder was also adapted for use on the 9x20 lathe. 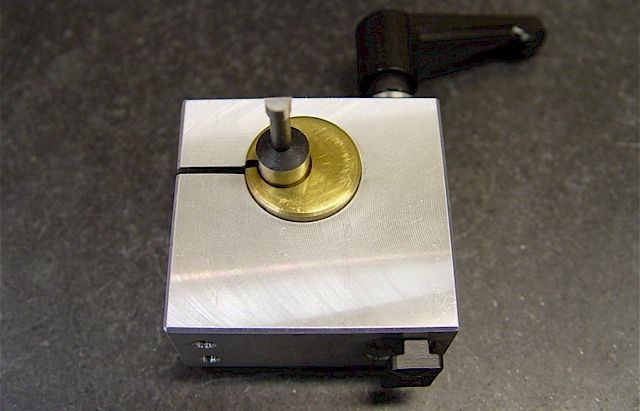 See T-bar Cutoff Tool. 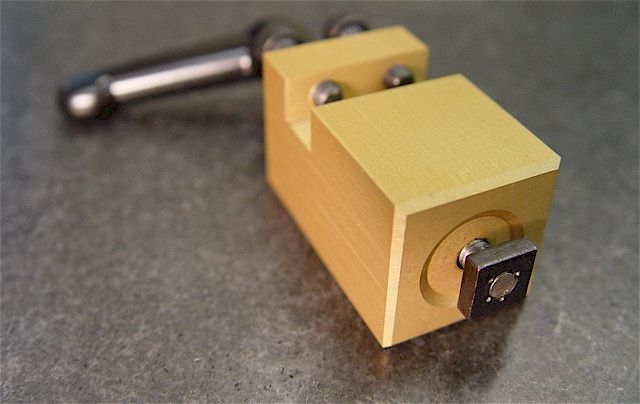 Standard tool post modified to hold an 8mm indicator holder rod. 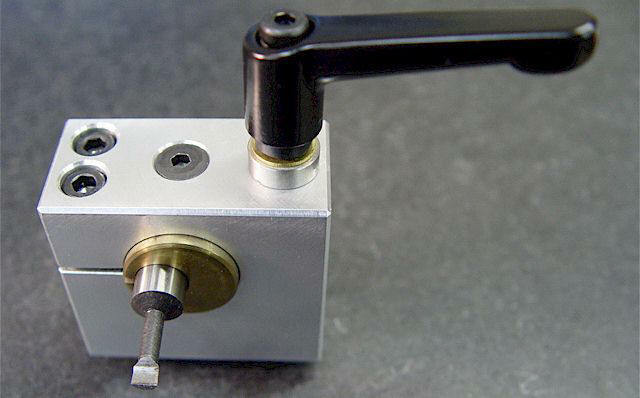 A threaded ratchet lever eliminates the need for a hex driver. Used a 1/4-20 threaded rod & a brass washer. 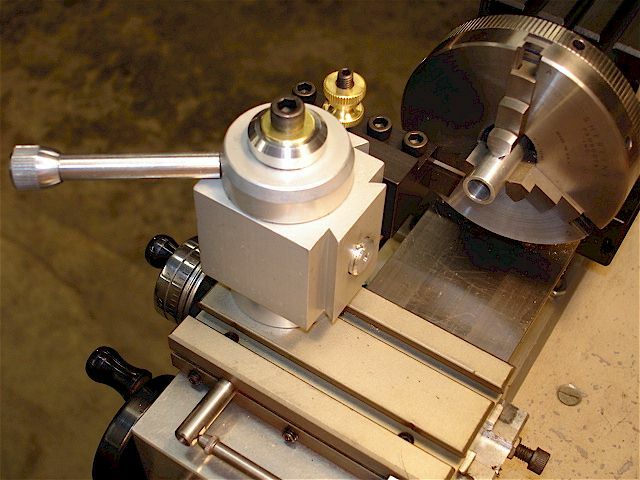 A simple 3/8" boring bar holder for the lathe. 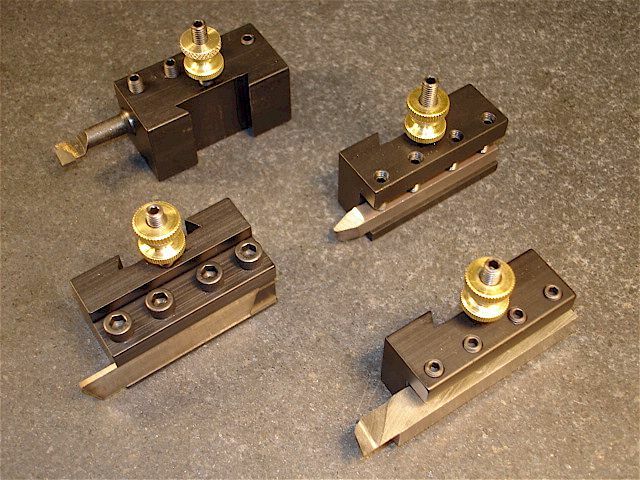 3/8" shank, brazed carbide insert & Cobalt-steel boring bar sets with a fixed-position, boring-bar holder. This holder uses two tie-down bolts. 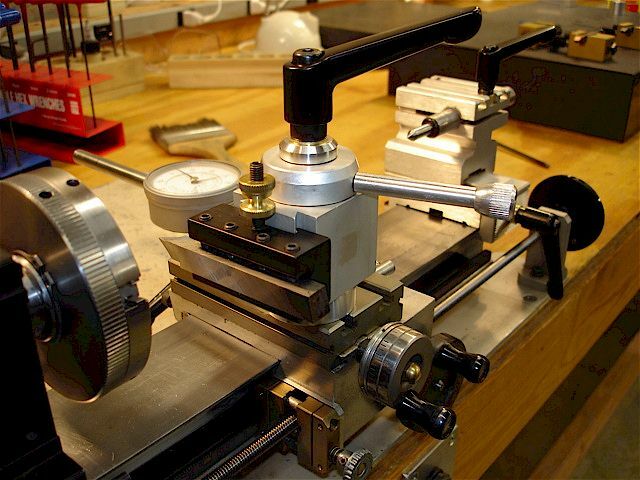 eccentric that allows adjustment of both the boring bar height & rake angle. 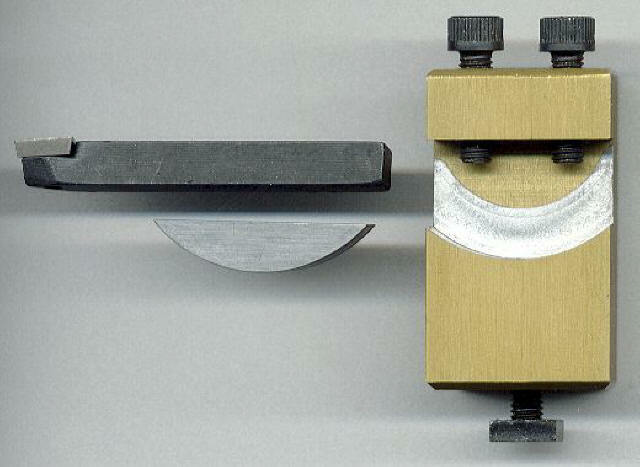 Note the small ridge (right side) that bears against the holder body & the center retaining groove. 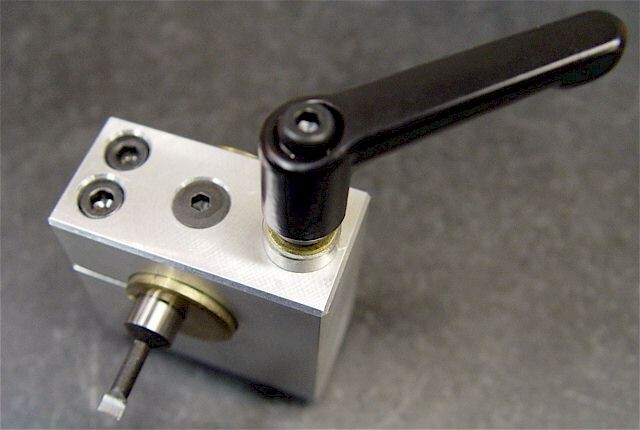 a 10-32 threaded rod & tightened/loosened by a zinc ratcheting handle. for the entire bottom surface. This is the same as found on the bottom of a standard Taig tool post. carriage lock & the tailstock. 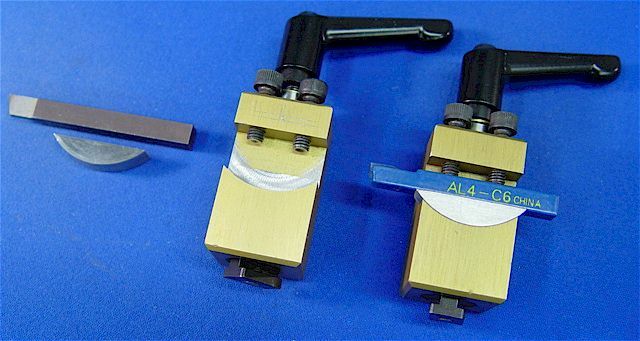 Used same style levers for the Jet lathe. 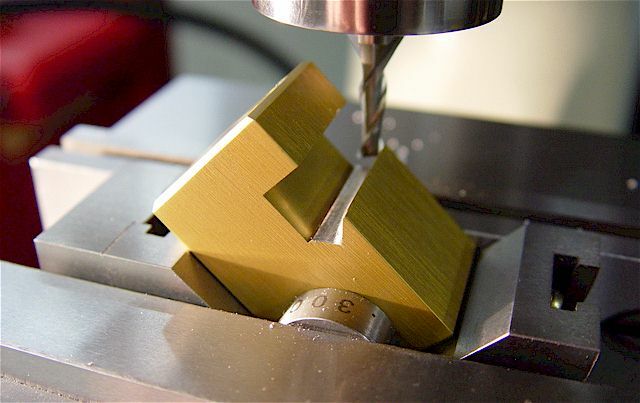 For a smoother finish, lock the carriage when performing facing or cutoff operations. 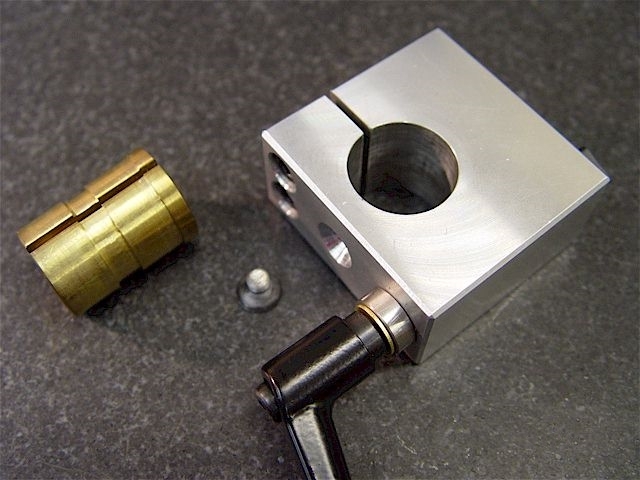 Dissimilar metals (steel, brass, aluminum) allow smooth locking/unlocking action.